Lou Reed took the last batch of V.U. songs with him and recorded them with studio musicians, emerging from the shadows into, well, more shadows. The resulting record, simply titled Lou Reed and adorned with a completely ridiculous cover, picked up where Loaded left off. The musicianship is a little sharper than last seen (having Rick Wakeman and Steve Howe on hand will have that effect), but the core set of songs is loaded with strong material: “I Can’t Stand It,” “Lisa Says,” “Berlin,” “I Love You,” “Wild Child.” If you were going to turn someone on to the Velvet Underground in its streamlined second incarnation, you could just as well start here without turning them off. 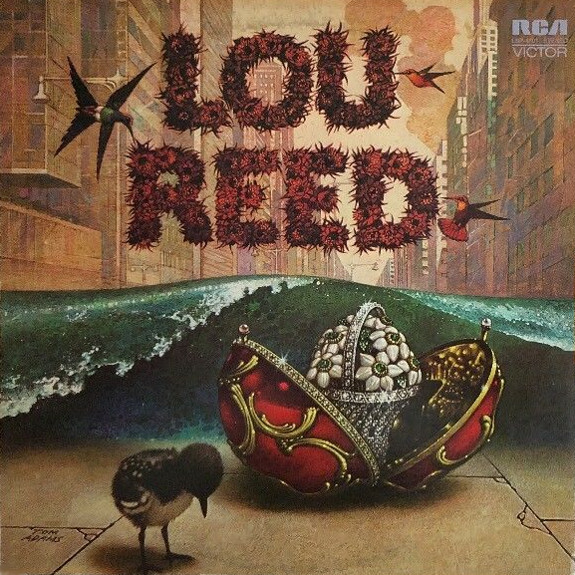 Reed would revisit some of these ideas on the darker Berlin; “The Kids,” for example, is essentially a rewrite of “Love Makes You Feel.” Although this is Lou’s show from beginning to end, Yes fans will enjoy Steve Howe slipping loose of his leash on “Ride Into The Sun” and Rick Wakeman’s flourishes on the closing “Ocean.” So if you’re listening to this record waiting to hear the Yes influences, hang in there. While this isn’t the first Lou Reed record you need to own (now that you’re not constrained by Time and its sticky, clammy hands), it’s not a false start by any means. In fact, it sets the template for things to come, as Lou Reed would write vicious rock songs with studio musicians for the next thirty years. Reed seemed a willing victim to ennui with the rockstar process at times, resulting in inferior records (contrary to Robert Christgau’s misplaced enthusiasm), but he seems suitably engaged on this session. Some have complained that the album is underproduced, and it is true that Lou seems to benefit from a strong-handed producer (which Richard Robinson presumably was not), but what would a Lou Reed record be without the rough edges? The answer to that question was apparently answered with Transformer. All songs written and arranged by Lou Reed. Lou Reed (vocals and guitar), Clem Cattini (percussion), Helene Francois (vocal harmonies), Kay Garner (vocal harmonies), Steve Howe (electric guitar), Les Hurdle (bass guitar), Paul Keogh (electric and acoustic guitars), Brian Odgers (bass guitar), Caleb Quaye (electric and acoustic guitars, piano), Rick Wakeman (piano). Produced by Richard Robinson and Lou Reed; engineered by Mike Bobak. Cover art by Tom Adams. Back liner photograph by Ronn Campisi. Released on elpee in May 1972 in the US (RCA, LSP-4701), the UK (RCA, SF 8281) and Australia (RCA, MLSP-4701); reached #189 on the US charts. Also released in 1973 in Spain (RCA, LSP 4701). Re-issued on compact disc in 1998 (BMG, 89842). Re-issued on compact disc on February 22, 2007 in Japan (RCA, BVCM-37725). Re-released on blu-spec compact disc in 2009 in Japan (BMG, BVCP-20018).